Catch up with distant friends and family with Gmail voice and video chat, or send them a text message with SMS chat. Pick a Gmail theme and spice up your inbox. Turn on Tasks and keep track of your holiday shopping. See your calendar, documents, and email all at once with Calendar and Docs gadgets. Get a new, faster Gmail app on your mobile phone. Use Mail Goggles to avoid sending out that embarrassing email after the company holiday party. Send in your self-addressed stamped envelope and get yourself some Gmail stickers. And there's more in Gmail Labs – forgotten attachment detector, superstars, and advanced IMAP controls – check out all the new stuff in the Labs tab under Settings. On behalf of the entire Gmail team, happy holidays! We'll see you in 2009. How often do you try to chat with somebody and they don't respond because they just walked away from their computer? Or maybe you're in the middle of chatting with them just as they need to leave. But you still need to tell them something -- something really important like you've moved where you're meeting...or ice cream! We need ice cream! This is why we built a way to chat with your friends even when they're away from their computers. Now you can keep the conversations going with a new Labs feature that lets you send SMS text messages right from Gmail. It combines the best parts of IM and texting: you chat from the comfort of your computer, and your friends can peck out replies on their little keyboards. A few weeks back, we ran into a few snags when we first started rolling this out, but starting today you can turn on text messaging for chat. Just click on Settings, and go to the Labs tab. Scroll down until you see "Text Messaging (SMS) in Chat" and select Enable and Save Changes. We're just trying it out for cell phones in the United States right now, but you can send texts to your friends with US phone numbers from anywhere in the world. You can start by just typing a phone number into the search box in the chat window on the left, then select "Send SMS." You can also select the contact you want to SMS first and then add their phone number. Once you give us a name for that phone number, you'll be able to start chatting. We'll save your friends' numbers in your Contacts, so next time you can just type their name in the chat box and select Send SMS. If you get a message from somebody you don't want to chat with from your phone, just reply with the word BLOCK. If you don't want to get texts from anybody using Gmail, reply with the word STOP and we'll leave you alone. Keep in mind that all these text messages count as part of your regular mobile messaging plan and might incur fees. So unless you know your friends have unlimited text message plans, please be sensitive to their phone bills. People use Gmail to get stuff done, so we've added a lightweight way to keep track of what you need to do, right from within Gmail. We put your tasks in the same kind of window as chats, so they're visible while you're scanning your inbox, reading mail, or searching (and in Settings, too!). Just pop your list out into a new window to use Tasks outside of Gmail. To enable Tasks, go to Settings, click the Labs tab (or just click here if you're signed in). Select "Enable" next to "Tasks" and then click "Save Changes" at the bottom. Then, after Gmail refreshes, on the left under the "Contacts" link, you'll see a "Tasks" link. Just click it to get started. Update 3/1/2009: Sorry, we're all out of free stickers. If you sent in a self-addressed stamped envelope postmarked by February 14, 2009, we hope you enjoy yours! Not too long ago, one of the Gmail engineers broke out her vinyl cutter and made some Gmail m-velope stickers. Pretty soon, they were pasted to our desks, stuck on our laptops, and adorning the walls around the office. Then other people started asking us about them -- first it was just other Googlers. But when a guy I was sitting next to on an airplane asked where he could get a Gmail sticker, we realized other people might like them too. So we designed some more, and printed up a whole bunch. There's the standard Gmail m-velope -- dressed up in glitter. One of three bookplate style stickers you can stick on anything from the inside of a favorite book to your laptop or your skateboard. (Trading with friends is encouraged -- we realize the unicorn isn't for everyone.) And there's a sheet of keyboard shortcut stickers intended as a tool to help people learn Gmail's shortcuts. The adhesive is a bit more removable than standard stickiness, so you can take them off once you've trained your fingers. Make sure to include enough postage to return a sticker pack via U.S. mail. It's less than one ounce, so a standard $0.42 stamp will do if you're in the United States; enclose an international reply coupon (IRC) if you're outside of the U.S. And be sure to send your envelope in soon -- one per person please. On the Google Desktop gadgets team, we've seen countless requests for a Gmail gadget over the years. That gadget is finally here, so if you've got Google Desktop for Windows, give it a try. You'll see that it covers the basics such as reading, searching, and sending messages. You can star messages, use the same keyboard shortcuts, and we didn't forget about contact auto-complete. It doesn't take up much space in your sidebar or desktop, and you can also resize it to show as few or as many messages as you'd like. When I'm at work, I keep two instances of the gadget open: one logged into my personal Gmail account and the other set to my Google Apps account for work related stuff. Instead of getting lost in a sea of tabs or browser windows, I can bring up the gadgets in an instant (hint: pressing the shift key twice brings up all your hidden Desktop gadgets). The Gmail gadget currently works with the latest release of Google Desktop for Windows. Try it out and please let us know what you think. Update: Changed title to clarify this is for Google Desktop. Oh snap. Last night, we started rolling out a new feature to Gmail Labs that lets you send SMS text messages right from Gmail. It combines the best parts of IM and texting: you chat from your computer and reach your friends no matter where they are. Your friends who are away from their computers get your messages as texts and can peck out replies on their little keyboards. It was pretty cool for a few minutes last night when we were sitting around texting each other. Then we found a glitch. When you'd try to turn it on, it wouldn't fully enable. We thought about keeping it out there -- bugs and all -- but the experience wasn't that great. So, in the spirit of Labs, we've pulled SMS chat back to fix it, and we'll get it back out to you as soon as it's ready -- probably within 2 weeks, so stay tuned. Gmail Labs has been a really fun way to easily try out new ideas and get some of our pet feature requests implemented quickly. We wanted to take this to the next level and let you start adding your own stuff to Gmail. Today we're launching a few Labs experiments that let you add gadgets to the left-nav, next to Chat and Labels. To get you started, we've worked with the engineers from the Calendar and Docs teams on two highly requested features: a simple way to see your Google Calendar agenda and get an alert when you have a meeting, and a gadget that shows a list of your recently accessed Google Docs and lets you search across all of your documents right from within Gmail. There's a third Lab that allows you to add any gadget by pasting in the URL of its XML spec file (e.g. http://www.google.com/ig/modules/youtube_videos.xml). We realize this isn't very user friendly right now; it's a sandbox mainly aimed at developers who want to play around with gadgets in Gmail. We're not tied to the left-nav as a primary way to extend Gmail -- in fact we think it is relatively limited and doesn't offer scalable real estate. There are also some downsides to the iframe-style Gadgets we're using today -- they can sometimes slow down the page. We're fanatical about speed, so we'll be keeping a close eye on performance. This is also a chance for us to test the developer infrastructure involved. We're using common gadget infrastructure, such as the Apache Shindig project, and working with other gadget containers to make gadgets more portable. We're looking forward to your comments in the Labs forum, so send us your ideas, let us know how you like the Calendar and Docs gadgets, and if you've written a gadget that you think works well in Gmail, post it and let us and other users try it out. (1) Try out Anatol's Navbar drag and drop Labs feature so you can easily re-order all the boxes on Gmail's left hand side. (2) Not all gadgets are fully compatible with https, so if you're connecting to Gmail via https, you may see mixed content warnings caused by parts of the gadgets being served over http. We're working on fixing this where we can. Update: To turn on these gadgets, click Settings, then visit the Labs tab. Scroll to the bottom, select "Enable" next to the features you want to turn on, and then click "Save Changes." Here on the Gmail team, we're always thinking of ways to help you communicate. Back in the day, we put chat right inside Gmail. Then along came group chat and more emoticons. And when we realized that late night communication had its downsides, we created a state-of-the-art lucidity test for after-hours email. Anyway, the black and white days of text-based emails have had their day. Following the evolutionary path blazed by colored labels, we present, in all their technicolor glory, emoticons in your mail. we've also added a whole new set for your enjoyment. When I joined the Gmail for mobile team a year ago, the mobile client worked like a web application designed for networks that were always available. This was fine on a fast and reliable network, but when you hopped on the subway, network reliability could be a big problem. Today, we're happy to announce Gmail for mobile 2.0 for J2ME-supported and BlackBerry phones. For this version, we changed our fundamental assumption about the network. We re-thought every action that you might perform with the app and tried to solve for the case where there is no signal. We wanted to make the mobile client faster and more reliable and added some other new features along the way. If you haven't tried Gmail on your phone in a while, try this new version and let us know what you think. Gmail for mobile 2.0 is designed to be more reliable in low signal areas and provides basic offline support for phones like the Nokia N95, Sony Ericsson W910i, and BlackBerry Curve. You can now log into multiple accounts (including both Gmail and Google Apps email accounts) at the same time. Switching between them is as easy as a few button clicks or just hitting + j on phones that have a QWERTY keyboard. We've also added support for multiple mobile drafts, undo (using the menu or the z shortcut), and sending mail in the background (no more staring at the "Sending..." dialog until it finally gets sent). Be sure to check the help page from Gmail for mobile's main menu for a list of all keyboard shortcuts. To download Gmail for mobile version 2.0, just go to m.google.com/mail in your mobile browser. Parlez-vous français? ¿Habla usted español? Gmail for mobile 2.0 supports over 35 languages, and the application language will automatically match your phone's language setting. Hello, you've reached Chad's mailbox. Thanks for your email about the latest Labs feature: Canned Responses, or email for the truly lazy. I'm on paternity leave so I won't be able to respond personally. Instead, I hope you'll enjoy this automated message. If you're sick of typing out the same reply every time someone emails you with a common question, now you can compose your reply once and save the message text with the "Canned responses" button. Later, you can open that same message and send it again and again. It couldn't get any easier unless Gmail automatically pushed the Send button. If you're lazy enough to think that would be a good idea, then read on, friend. After hearing consistent feedback that you wanted more control over your contacts, we've changed the way Gmail suggests contacts to you. Up to this point, if you emailed someone five times, we'd automatically move them into My Contacts. Now, we'll no longer automatically add contacts to your My Contacts group. Instead, you can go to Suggested Contacts, select the contacts you'd like and move them into My Contacts. All of your contacts -- whether they're in My Contacts or Suggested Contacts -- will continue to show in auto-complete as you're composing messages. As part of this change, we're moving previously auto-added contacts back into Suggested Contacts. Only contacts that you've edited, imported or added to a group will remain in My Contacts. This will provide everyone with a clean slate and, we hope, a better point for syncing contacts with mobile devices (for example with Android). We'll be rolling this change out to everyone over the next few days. We realize there's a lot we can do to make Gmail contacts even more useful, and the feedback we received last time we updated the contact manager was helpful, so keep letting us know what you think. The first Android-powered phone, the T-Mobile G1, is coming out on Wednesday. My friends know that I work on Android, and as you can imagine, I get asked about it all the time. I have a lot to say about the G1, but I always begin by telling them that lots of Google products, including Gmail, are available for free, on several mobile devices. I've been using Gmail on the go for more than a year now and it's difficult to imagine my life without ubiquitous email access. It proves handy every day -- whether for keeping a close eye on a (very) busy inbox, finding the address of a party while already in the taxi, or sending out a spontaneous dinner plan while on the bus back home. If you like using Gmail on your computer you'll feel very much at ease with Gmail on Android-powered phones. You can download documents and MP3s, manage and view labels, star and archive messages, save drafts and even report spam. I check my email frequently and have two Gmail accounts -- one for work and one for personal life. Before I started using Gmail on the T-Mobile G1, I used to check my mail by actively reloading or refreshing my inbox on one of my other mobile devices. And with two email accounts, I had to repeat this twice each time. Not anymore. With the combination of push email and notifications on the status-bar, I never have to check for new mail. Whenever a new message arrives, I immediately get notified (in real time) with a little "@" sign at the top (see image below on the left). With a single swipe I can pull down the notification pane and see my new messages (on the right). But the best thing, in my mind, about Gmail on Android-powered phones, is the way email is deeply integrated with other applications. For instance, let's say I'm browsing the web, reading my favorite tech blog. When I come across a post that I'd like to share, I can simply press and hold my finger down on the link and then choose "share" to immediately create an email with that article's web address. The tight integration with Contacts on the device then allows Gmail to suggest contacts based on the first letters I type. All of your Gmail contacts are immediately available on the phone upon first log-in. And whenever you create a new contact on the device it's automatically synced with your Gmail contacts and therefore immediately backed-up, so you never need to worry about losing your contacts if you lose or break your phone. I often send messages where the subject is the entire message (e.g. "Want to grab lunch at 12:30? "), and Gmail would always prompt me to add in body text. Now, however, you can add "EOM" or "(EOM)" at the end of the subject line (short for End Of Message), and Gmail will silently send the message without the unnecessary prompt. From the team that brought you Mail Goggles, here comes...Advanced IMAP Controls, a Labs feature that lets you fine-tune your Gmail IMAP experience. You can choose which labels to sync in IMAP -- useful if you find your mail client choking on a big [Gmail]/All Mail folder. After enabling this Lab, just go to the Labels tab under Settings. You'll see a new 'Show in IMAP' checkbox next to each of your labels. Uncheck the box and the corresponding folder will disappear from IMAP. There are also some more obscure options for those of you who want to make Gmail's IMAP work more like traditional IMAP providers: you can turn off auto-expunge or trash messages when they're no longer visible through IMAP. The IMAP protocol allows messages to be marked for deletion, a sort of limbo state where a message is still present in the folder but slated to be deleted the next time the folder is expunged. In our standard IMAP implementation, when you mark a message as deleted, Gmail doesn't let it linger in that state -- it deletes (or auto-expunges) it from the folder right away. If you want the two-stage delete process, after you've enabled this Lab, just select 'Do not automatically expunge messages' under the 'Forwarding and POP/IMAP' tab in Settings. By default, Mail Goggles is only active late night on the weekend as that is the time you're most likely to need it. Once enabled, you can adjust when it's active in the General settings. Hopefully Mail Goggles will prevent many of you out there from sending messages you wish you hadn't. Like that late night memo -- I mean mission statement -- to the entire firm. First, if you don't have Gmail keyboard shortcuts enabled, turn them on in Settings. You'll be glad you did. If you spend a lot of time in Gmail, you'll start shaving milliseconds of every action, which adds up. Get through a hundred or so messages every day and you'll end up with extra minutes each week to read your favorite blogs in Reader -- using Reader's keyboard shortcuts of course. If I'm on my own computer I don't even have to do this, since I have the "Remember me on this computer" option checked on the Gmail homepage. 2. Get rid of stuff I obviously don't need to read. I scan the senders and subjects of unread messages in my inbox, navigate through the messages using k to move the cursor (little black triangle) upwards and j to move it back down. As I'm moving around, I select all of the messages I haven't already filtered but don't need to read using x. And archive them all with y (e works for this too). Now I just have the messages I should read. 3. Get through the mail I do need to read. I find a message that looks important or interesting, and open it using the enter key. If I need to reply, I hit r. Reply all? That's a. Once my response is ready to go, tab + enter sends it on its way. Back to my inbox with g + i. More navigating around with j and k, selecting with enter. Archiving (y) and replying (r). Starring some stuff for later (s). The occasional forward (f). Sending with tab + enter. It may seem like a lot to remember, but for me, these eleven shortcuts have been invaluable and aside from j and k, which I just had to practice, pretty intuitive (g + i? that's for "goto inbox"). If you ever need a quick refresher, hit ? anytime to see the shortcut reference guide. And if you don't like any of them, you can edit the defaults and define your own by enabling Custom keyboard shortcuts in Labs. Seemingly small improvements can make a surprisingly big difference to people who use our products every day. Take Google Calendar, where over the past few months we've made a bunch of little improvements in direct response to feedback from our most active users. We've long offered the ability to email meeting attendees, which can be extremely useful for sharing last-minute details or distributing meeting minutes afterward. But it was an all-or-nothing affair -- if you wanted to email only those people who hadn't responded, for example, you needed to manually fiddle with a list of email addresses. In response, we made several improvements to the email guests dialog. You can now select guests based on their response status or pick-and-choose them individually with checkboxes. Displaying another person's calendar used to be a many-stepped process. It wasn't such a big deal if you only did it occasionally, but many of you do this numerous times a day, especially if you manage co-workers' calendars. It's much easier now: you simply start typing a name in the "Add a friend's calendar" box and we'll match against your address book. Click the name, and the calendar will be added. Making a new event from the Day or Week view is really easy -- you simply click on the time, drag the duration and enter a name. But if you have a busy calendar (and who doesn't?) you probably bumped into some problems. If an event is already scheduled for that time, there was no way to click and drag without messing up the other events on your calendar. You told us you often worked around this by creating the meeting in an open slot and dragging it to the desired time. Lots of extra work. We got lots of feedback about our event reminders, and particularly the limited number of time choices. One Googler actually asked for the ability to set eight minute reminders. Why eight minutes? He found that 5 minutes wasn't enough time to get to his meetings and 10 minutes was so early he tended to ignore them. Not everyone needs such precision, of course, but everyone deserves more flexibility. As of today, you can now set a reminder for any time between 4 weeks and 5 minutes before your event. Perhaps big launches and shiny new features get most of the attention, but little things matter too. Even just a few pixels can turn "arrghh!" into "ahhhh!" 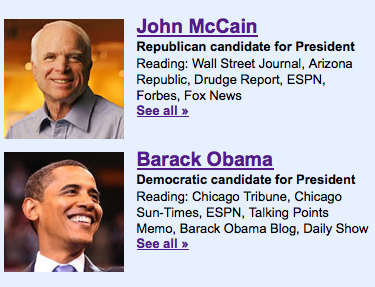 Today we announced that both the Obama and McCain campaigns as well as political contributors from Newsweek to POLITICO are sharing news with Google Reader this election season. You can see their most recently shared items at google.com/powerreaders, or add the feeds from your favorite campaign or journalist to Reader to keep up with newly posted items and comments. P.S. If you want to follow these political shared news feeds right from within Gmail, check out our post from a couple weeks ago about getting your favorite feeds in Gmail web clips.